MINERAL — Former Mineral High School cheerleaders led a crowd Saturday of about 100 alumni and some village residents in singing the school's fight song at a brief unveiling ceremony of the Mineral School Memorial. 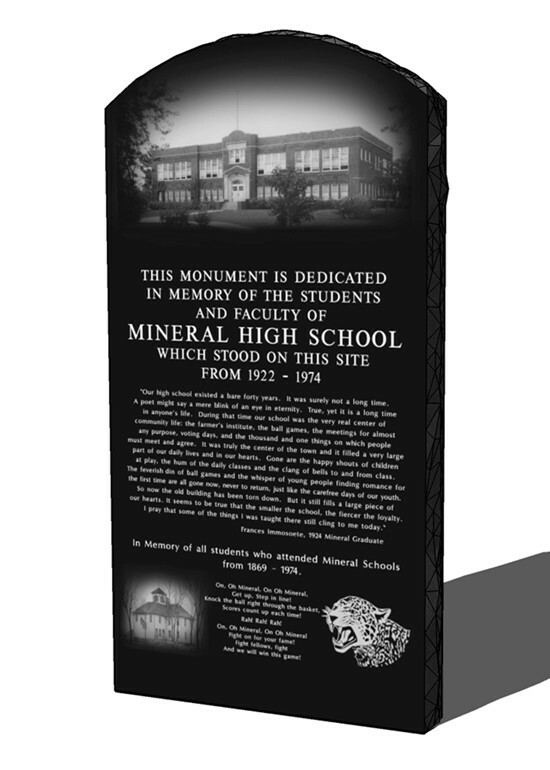 "We hoped we could do something to remember the school," Dave Nanninga of the Mineral Pride Society told the crowd assembled for the late afternoon ceremony where the black marble memorial towering 7-feet tall and 4-feet wide was unveiled. The memorial was erected at a cost of more than $10,000. "This is pretty incredible when you think about the size of the town and that all donations were from the private sector," said Nanninga, who attended the Mineral school for three years. "We have sold nearly 100 bricks with inscriptions on them in memory of the purchaser's wishes." Some of the audience Saturday sat in actual balcony seats that once formed the seating around the upper level of the Mineral gymnasium. The American flag and Mineral High School flag will fly over the memorial using the actual flagpole that has been refurbished and once stood atop the former Mineral brick school building. Floodlights will illuminate the flags and the memorial at night. Two granite benches purchased by the Sierens and Moore families will provide a place for visitors to sit and reflect on the many memories they have of their life spent in Mineral while visiting the memorial. On the front of the stone is a likeness of the brick Mineral school building. Remarks made in 1924 by Francis Immesoete of the Mineral High School Class of 1924 are engraved on the memorial stone. At the bottom of the stone on the left is the words of the Mineral High School fight song sandwiched between a photo of the frame school building which served the community from 1870 to 1919 and the leopard mascot for Mineral High School athletic teams. Those people who donated more than $1,000 in money or labor are also listed on the rear of the memorial. The former Mineral School grounds was located at the intersection of Third Street and Central Avenue in this village in western Bureau County. Mineral High School's first graduating class earned their diplomas in 1894, and the school closed its doors in 1961 after the Mineral School District was annexed into the Annawan School District. The brick building continued to serve as an elementary school for kindergarten and Grades 3-5 for the Annawan School District until 1974 when the final group of students left. The building was never used again and was razed in the fall of 1998. To date, more than $17,000 has been raised for the memorial with 400 more bricks that can be purchased. Anyone wanting to buy a brick can contact Sue McCauley of Mineral for further details. The unveiling ceremony was held prior to the annual Mineral Alumni Banquet held later Saturday. Nanninga said the high school's last alumni banquet will be held in 2011, 50 years after the high school was closed. The following writing was provided by 1943 Mineral HS alumnae Virginia (Verdun) Romero. She wrote the piece as if the building had a spirit, and a copy of her message was passed out to all in attendance. There was once a time when I was a strong, imposing building, recognized as a place where education was achieved and known to all as the ‘Mineral Consolidated School.’ Now my restless spirit hovers above an empty knoll. I think back to the time of my conception, which followed a passionate interaction between those of the male / female gender. In this case not to produce a child, but to the achievement of a building that would bring knowledge to generations. I would be the phoenix to arise from the ashes of a former school destroyed by fire! Beginning in 1922, and for nearly two years, the pallets of bricks, bags of cement, stacks of structural timbers, miles of electrical wire and, well, all of the supplies used in construction slowly blended together to become a sturdy, fire-resistant hall of learning. My doors flung open to welcome the first group of students in September 1924! Some children came as shy first graders, hesitantly and in awe of my great halls. Some returned with the bravado of ‘upper classmen’, high school age boys and girls on their final approach to being adults. Some walked my halls briefly and moved away, while some returned each fall for 12 years. Some came only because it was required by law. Some came for the necessity of achieving a high school diploma in their pursuit of higher education. I am overwhelmed with memories of 40 years. Some memories cause the painful recall of former students who lost their lives in plane crashes, to drowning, auto accidents, casualty of war or just an untimely death. There were humorous, yet poignant thoughts of some shy young lad sneaking a kiss behind the wall next to a water fountain, the first venture into the arena of ‘puppy love.’ I admit to even this ‘spirit’ still having a ringing in my ears from the shouting and applauding associated with basketball games in my gym. I recall the strains of “Pomp and Circumstance” on graduation night; for some years as a piano solo and later with the establishment of a school band, the sound of brass, strings and timpani resounded throughout my halls. And yes, thoughts go the parade of teachers, some educators of quality, others who came rather lacking in the high credentials to keep them from attaining higher salaries in larger schools. There were, of course, a few bullies and troublemakers, best forgotten. For all I remember of the ‘good years,’ there came a time when it was no longer financially advantageous to keep my doors open to a 12-year curriculum. I became the shepherd of a few tiny tots of kindergarten and grades 1 through 3 for a few more years, but the sight and sound of children in my classrooms and halls ended forever in 1964. I was left to stand alone and lonely, subjected to the snows of winter that deteriorated my roof; the rains of spring that seeped through cracks to stand and warp my floors; to scampering ‘critters’ who gnawed, scratched, littered and raised generations of ‘young-uns,’ and even to having my windows destroyed by rocks thrown in the name of fun by some misguided youths. For all that I suffered, the worst was yet to come. In 1998 the wrecking ball destroyed my walls, the dump trucks carried away debris that was once classrooms and the hollow space of my gymnasium was again filled with soil. Even a spirit finds the necessity of ‘moving on,’ so I wander to a corner of the property where some workmen are pouring cement. I am amazed to learn that whatever is shrouded in blue plastic is in fact a memorial to me! I hear the men talking about some upcoming dedication ceremony, so I think I’ll stick around for a little longer. Maybe I’ll see some familiar faces, students from past time. Maybe I’ll hear some kind words about my useful days. Maybe I’ll even see a tear or two. For sure I’m going to look for that Dave fellow. Even though I can’t actually speak to him, I think I can make him realize my spirit is hovering about in grateful appreciation of being revered, remembered and replaced by what I might refer to as a smaller phoenix. One that arose from my ashes, and will forever stand in the memory of Mineral School! Then I guess it will be time to take one more look back before I turn to take my place in history. Even a spirit must bow to destiny. ____I wish to make a donation of $____ for this project. Unfortunately your donation will not be tax deductible. Please contact Dave Nanninga at (773) 315-0556 if you have any questions regarding this project. The following article provides preliminary information on a memorial for the former schools which served our community proudly from 1869 to 1974. Prior to the brick school building serving our town, there was a wood frame school building which served Mineral from 1870 through 1919 when it burned to the ground. The brick Mineral school building was built between 1920 and 1922 at a cost of $64,000 on the same grounds as the former wood frame school. It served the community of Mineral as a grades 1 through 12 school from 1922 through 1961. After Mineral High School was annexed into the Annawan School District in 1962, the Mineral school building continued to serve the communities of Mineral, Hooppole, and Annawan as an elementary school until it was closed in 1974. The school sat proudly for 24 more years when it was eventually razed in 1998. I only attended the Mineral school for kindergarten (in the old “shop” and bus garage building) and grades 3,4, and 5 from 1970 through 1973. I feel very blessed and fortunate to have attended this grand old building. I remember at an early age listening to the stories of the great Mineral High School sports teams and the pride the school brought to the community. I distinctly recall walking down the upstairs hallway, staring at the class photos of the many graduating classes, stopping to stare at the trophy cases full of the trophies that were once hoisted proudly in the air by the kids who had won them. I often got a sad feeling, knowing I would never play for the Mineral Leopards. My grandmother, Ula Morey, would beam so proudly as she would relate the stories of my uncles, Ben and Eddie, and of the many great basketball teams she cheered on for decades. I feel truly driven to create something for the memory of the school and those who attended there. Also for the many townspeople, faculty, administrators, and board members who worked so hard to make this school and the education of the children of our town a priority. Mineral was one of the most tight-knit communities in the area, something I was fortunate enough to experience as a child growing up there. I have often felt that the school is the heart of any community. I have created a website to honor all high schools and the towns that once supported them. The website is titled “Illinois High School Glory Days” and can be viewed on the internet at www.illinoishsglorydays.com .